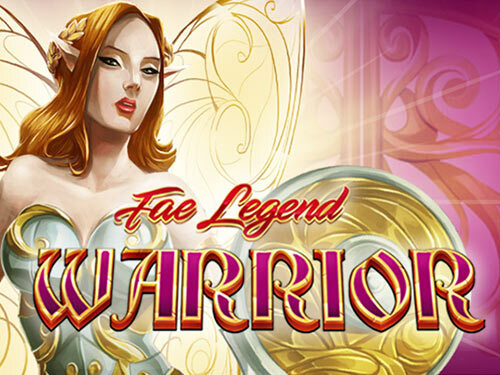 Join Fae, the legend warrior through the enchanted forest and spin your way through 5 reels of fairies to attain legendary status and collect wins up to 5000 times your initial stake. This game is a perfect for any online slots casino gamers who want to escape into a fantasy world and earn themselves some tasty free spins and multipliers. Click now! Eyecon was founded in 1997, just in time to take part in the online betting revolution. This development company specialise in both land-based and online games to gambling industry. Currently they have more than 100 slot machine titles in their portfolio, many of which are designed to an impressive standard with its themes, 3D graphics, animations and immersive gameplay features. They also specialise in other casino classic games and bingo titles, and to further expand their reach they have translated the languages for many of their games for new geographical markets. Read here for more Easy Slot games from Eyecon. 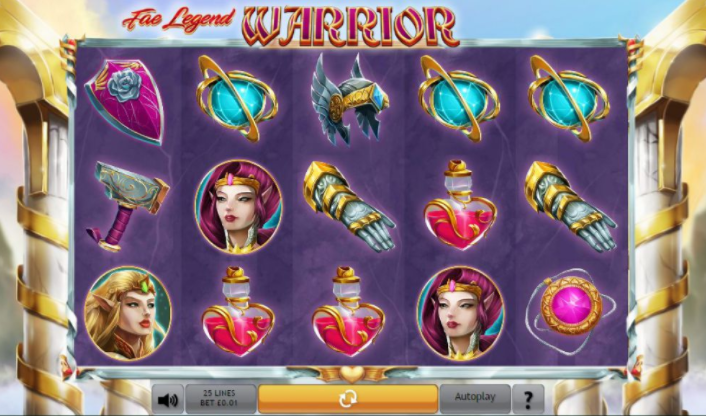 Fae Legend Warrior is an online slot game that gives you the opportunity to embark on a magical adventure with faeries, and no one is going to tell you that they aren’t real in this slot game. 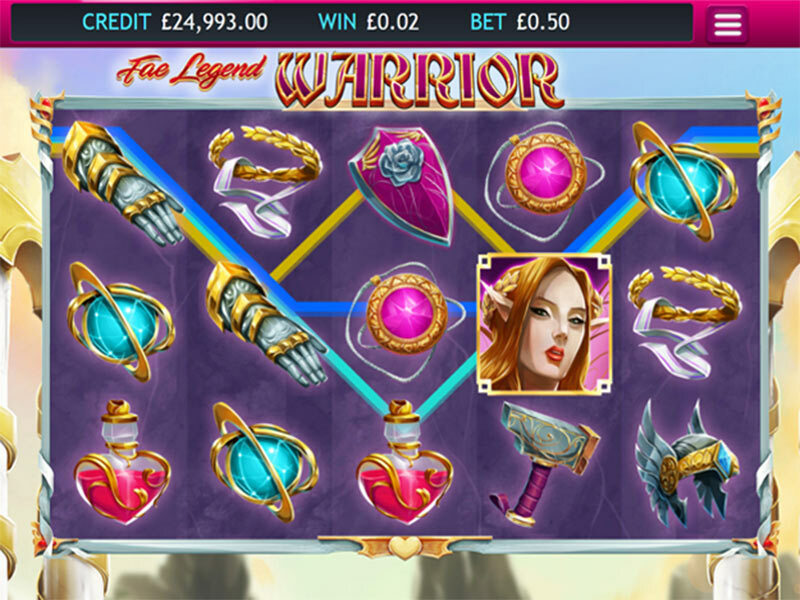 You will be full of wonder as you spin the reels and encounter faeries, warriors and lots of enchanting wins with this stunning 5 reel, 25 payline online slot game. You can spin away from 1p up to a maximum of £50 per game. We also often run various UK slot promo with this game. The reels are decorated with beautiful faerie warrior women, and you will soon see from the symbols that these are more like the legendary Valkyrie warriors that Thumbelinas. You have Armour, Shields, Axes, necklaces and Laurel Crown symbols. If you can land 5 of the Blonde Warrior symbols on an activated payline you could win an impressive 5000x multiplier of that line bet! The Legend symbol is your Wild and it will substitute for all symbols except the Warrior Scatter symbol. Your prizes will also be doubled when the Wild symbol helps with a winning combination. The red-headed Warrior is the Scatter, land 3 or more of her on the reels and this will trigger the Prize Pick Feature. You will be awarded one pick for each Warrior Scatter symbol in the triggering combination, and each pick comes with multiplier prizes up to 100x your bet! If you land 3, 4 or 5 Warrior Scatters anywhere on the reels you will also trigger 15, 20 or 25 Free Spins. During the Free Spins feature your line wins are tripled! The Free Spins feature is played with the same paylines and wagers as the triggering game, and you can retrigger further Free Spins during the feature, up to a maximum of 15 times. You also have a Wild Scatter symbol which is represented by the Key symbol, this symbol will not only fill in winning lines with a x2 multiplier but it will also unlock up to 25 Free Spins that come with a x3 multiplier! Deposit and Spin today, Know more about mobile billing casino to get started! 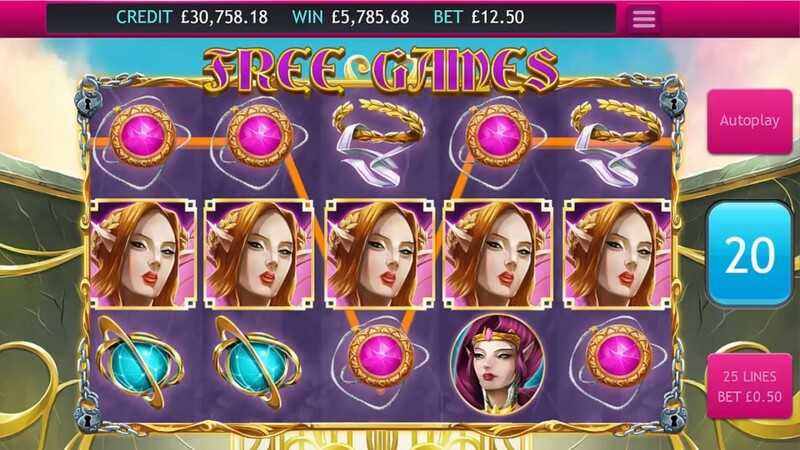 If you love the idea of stepping into a magical land filled with warrior faerie women then you are going to be enchanted by the theme of this online slot game. Set in a mythical kingdom and full of stunning warrior women, this game is a feast for the eyes. The gameplay is highly enjoyable with its lucrative symbols, especially the Blonde Warrior. You also have Free Spins, impressive multipliers and cash prizes. You will fall in love with this game for all time. If you enjoyed Fae Legend Warrior you might also like Thunderstruck online slots.